Le Lion Cross Country Day: USA! USA! USA! One for the big tracks: Liz Halliday-Sharp and Cooley Moonshine lead going into the final phase at the six-year-old World Championships. Photo by EquusPix. 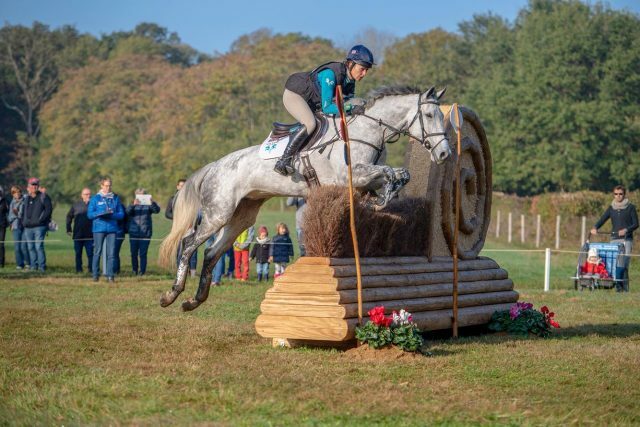 US representative Liz Halliday-Sharp remains atop the six-year-old leaderboard at Le Lion with Cooley Moonshine after a jam-packed day of cross country action. They added nothing to their impressive dressage score of 22.4, coming in 13 seconds below the optimum time of 8:56 to edge out the encroaching competition. The child prodigy in action: Liz Halliday-Sharp and Cooley Moonshine. Photo by EquusPix. In a top ten that remained virtually unchanged British riders took three of the top five spots, with Millie Dumas and Universal Cooley maintaining their hold on second place. Millie Dumas and Universal Cooley. Photo by EquusPix. Kitty King and the stunning grey Selle Français Cristal Fontaine also held onto their post-dressage placing, staying in third overnight. Kitty King and Cristal Fontaine. Photo by EquusPix. 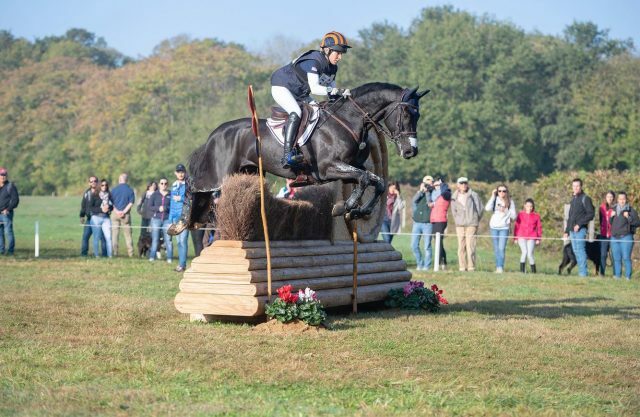 Rebecca Howard and Trebor, owned by Canadian eventer Kelly McCarthy-Maine, make their move towards the top ten. Photo by EquusPix. A fast clear moved Rebecca Howard and Trebor one place up to 12th overnight, while second ride Cooley Convinced moved up two places after her double clear. Mexico’s very first representative at Le Lion, Pedro Gutierrez‘s California Mail looked capable and confident throughout her round, adding nothing to her dressage score and moving up to 32nd place from 39th. 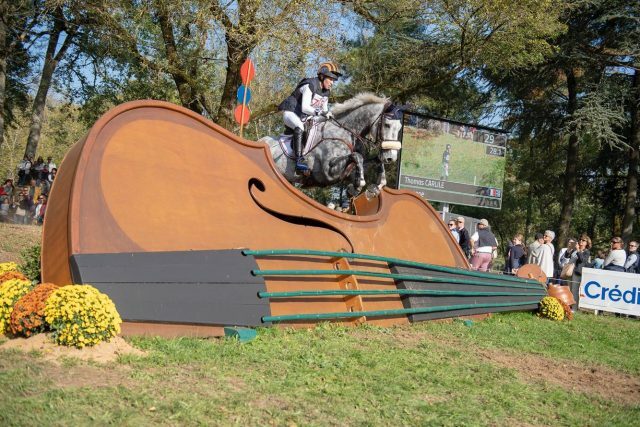 Pedro Gutierrez and California Mail serve up a double-clear and a little bit of Le Lion history, too. Photo by EquusPix. The second US representatives, Tiana Coudray and Happenstance, were one of two combinations who failed to complete the course — they took a tumble at fence 12 and walked home. 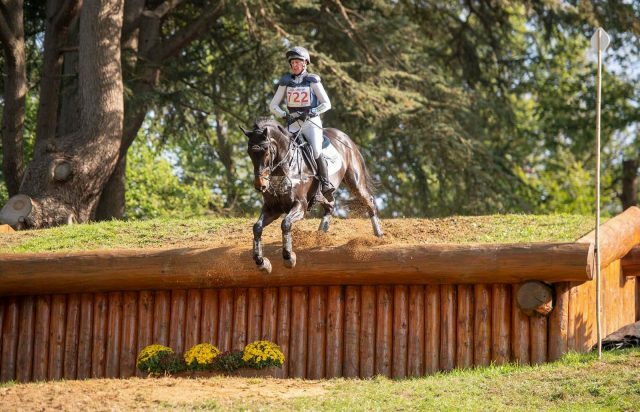 39 out of 41 starters completed the six-year-old CCI1* course, with five of the 39 finishers picking up cross country jumping penalties. Twenty-seven pairs produced double-clears. The top ten in the six-year-old World Championships after the cross country phase. Germany’s Ingrid Klimke moved up a place into the lead in the seven-year-old class after delivering a confident clear round with the Brandenburg mare Asha P, coming home ten seconds under the optimum time of 9:14. Ingrid Klimke’s Asha P steps into the lead after a bold round. Photo by EquusPix. 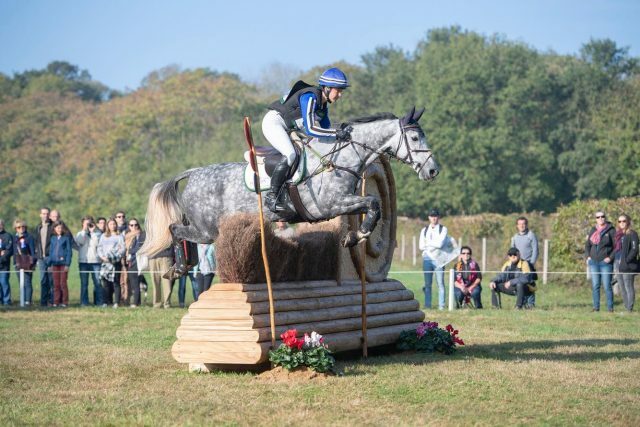 Ingrid, who considers the exciting young mare one of her future superstars, was delighted to further her education at the French venue: “It was pure fun and she learned so much, because the course is fantastic. You have so many different combinations where you learn so much about them and they can gain a lot of mileage. Ingrid Klimke and Asha P. Photo by EquusPix. Of course, a clear round within the time on its own was never going to be enough to allow Ingrid and Asha to lead going into the final phase — overnight leaders Michael Jung and Choclat would have to make a mistake in order for that to happen. To everyone’s surprise, they did just that. 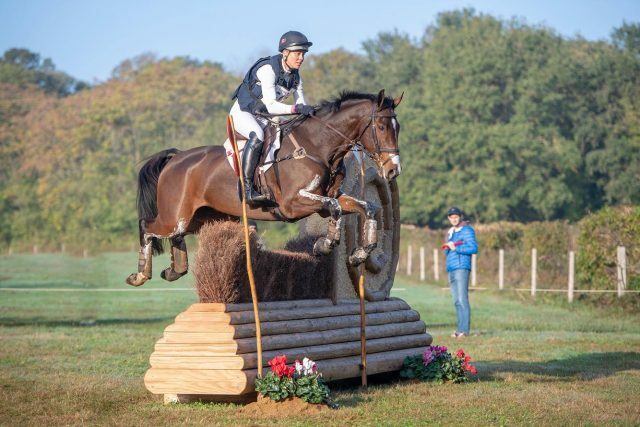 The maestro of modern eventing and his talented youngster began the course brilliantly, with the gelding easily finding his optimal cruising speed and making economical use of his naturally sweeping stride. But then, at fence eight — an innocuous brush fence named the Burghley Fence — the horse appeared to second-guess his stride and he never quite got out of his own way. He caught a front leg on the fence and the pair were pitched over the top. Both got up immediately and walked away. They weren’t the only high-profile non-completion: Le Lion resident Tom Carlile and the Selle Français mare Birmane were also victims of the Big E, further blotting Tom’s impressive record of FODs at this venue. Theirs was a rider, rather than horse, fall, and it came at fence 21, just two fences from home. 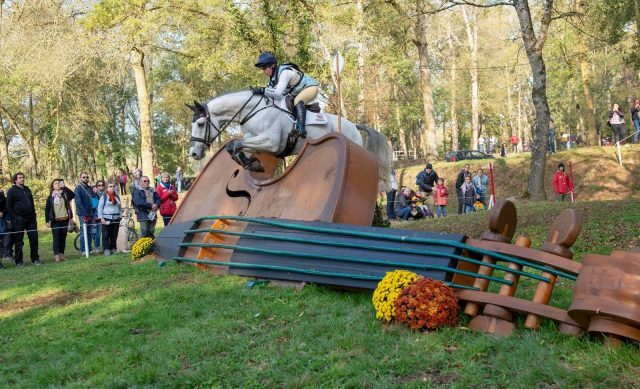 Again, this happened at one of the less obviously challenging fences on course – having jumped the enormous drop and angled hedges at 19 and 20, the corner at 21 must seem rather like a speedbump on the way home. 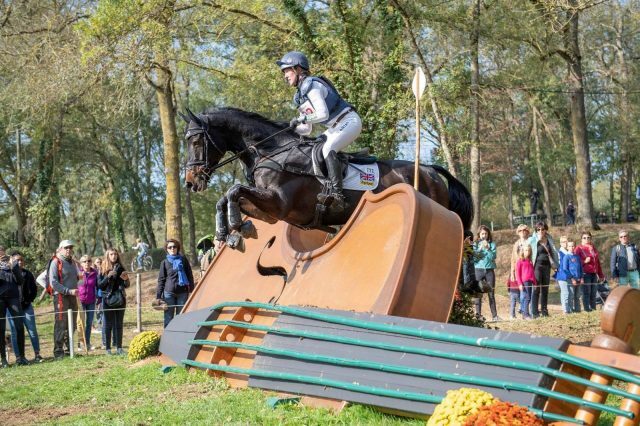 But this is eventing, and predictable it ain’t, so when Birmane twisted in the air and knocked the flag with her knee, Thomas was sent tumbling. Like Michael, he was up immediately and looked no worse for wear, while Birmane made a beeline for her gathered fans and rather charmingly evaded capture for a while. The seemingly straightforward corner went on to be responsible for three falls throughout the day. Nicola Wilson and JL Dublin. Photo by EquusPix. Nicola Wilson and JL Dublin moved up into second place overnight, adding nothing to their dressage score and coming in twenty seconds under the optimum time. The British contingent made an impressive impact on the top of the leaderboard: Tom Jackson, who heads to Pau next week with two horses, piloted Capels Hollow Drift to a double-clear and overnight third, while Sarah Bullimore and Corouet, a son of her four-star mare Lily Corinne and graduate of the six-year-old class here last year, moved into fourth. 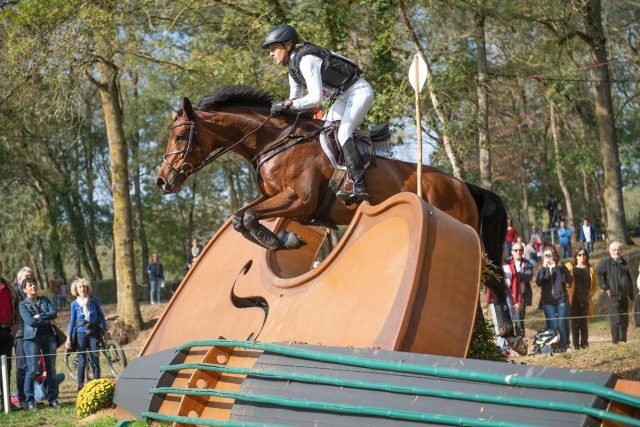 Behind them, French eventing’s answer to Noah Centineo, Astier Nicolas, sits in fifth with Babylon de Gamma. This is probably still enough to make the French cry. We appreciate that. Liz Halliday-Sharp puts the pedal to the metal on her second ride of the day to sit just outside the top ten. Photo by EquusPix. 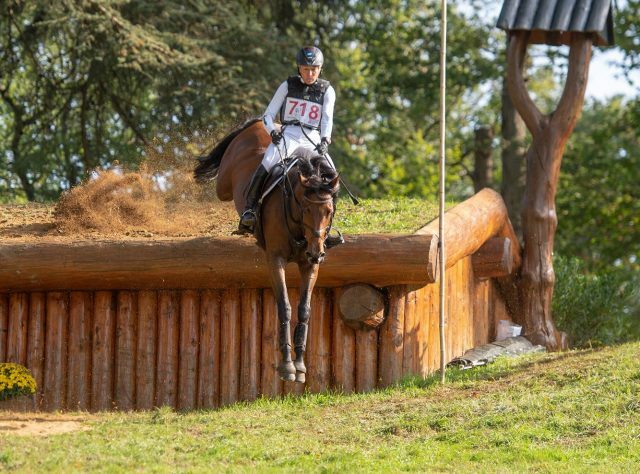 Liz Halliday-Sharp and Cooley Quicksilver climbed twelve places to sit twelfth overnight after adding nothing to their dressage score, while Doug Payne and Quantum Leap, too, delivered a sterling double-clear to climb from 59th to 31st going into the final phase. Doug Payne and Quantum Leap make an enormous jump, both down this colossal drop and up the leaderboard. Photo by EquusPix. Ten of the 69 starters failed to complete, while 18 of the 59 finishers picked up cross country jumping penalties. The most influential part of the course was fence 19AB and 20, the colossal drop to two angled hedges, where we saw twelve faulters, including four 50s for missed flags. Ireland’s Michael Ryan picked up 50s on both of his horses, collecting them at 19B, the first hedge, on Briarhill Marco and 20, the second, on Barnahown Corn Hill. Laura Collett‘s British Young Horse Reserve Champion Calmaro was another faulter on course, picking up a green runout and 20 penalties at the narrow final element of 10ABC, while Izzy Taylor and 2017 six-year-old World Champion Monkeying Around ran into problems at the end of the course. 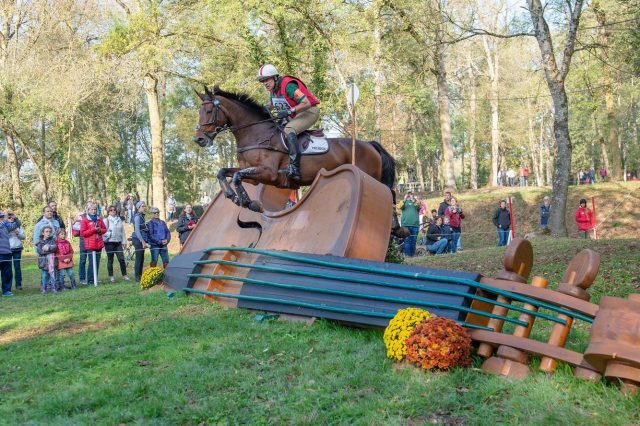 The horse appeared to gain in strength after jumping through the drop and hedges, flipping his head on the way to the corner at 21, giving him no opportunity to see the fence and resulting in a 20 penalty blot on their record. The final horse inspection will take place tomorrow morning at 8.30am local time, with the six-year-olds trotting up first. 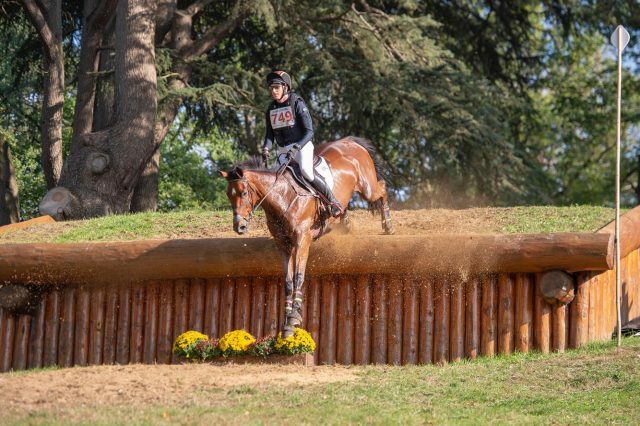 We’ll be bringing you all the news and some beautiful photos from our friends at EquusPix — stay tuned, and in the meantime, GO LIZ AND BILLY and Go Eventing! The top ten going into the final phase in the seven-year-old World Championship.